Conceptually this project aligns with notions of the forensic aesthetic and extends on my interest in exploring the visual vernacular of artificial and natural interfaces through themes such as ruin, absence and abandonment. 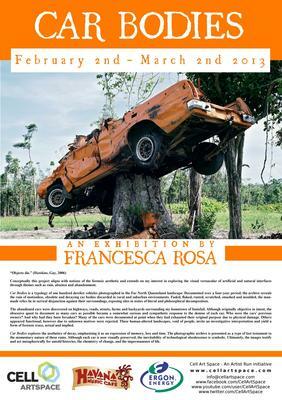 Car Bodies is a typology of one hundred derelict vehicles photographed in the Far North Queensland landscape. Documented over a four-year period, the archive reveals the ruin of motionless, obsolete and decaying car bodies discarded in rural and suburban environments. Faded, flaked, rusted, scratched, smashed and molded, the man-made relics lie in surreal disjunction against their surroundings, exposing sites in states of literal and philosophical decomposition. The abandoned cars were discovered on highways, roads, streets, farms and backyards surrounding my home town of Innisfail. Although originally objective in intent, the obsessive quest to document as many cars as possible became a somewhat curious and sympathetic response to the demise of each car. Who were the cars’ previous owners? And why had they been forsaken? Many of the cars were documented at a point when they had exhausted their original purpose due to physical damage. Others appeared functional, however due to unknown motives were rejected. These human-altered landscapes, void of people, invite an investigative interpretation and yield a form of forensic trace, actual and implied. Car Bodies explores the aesthetics of decay, emphasizing it as an expression of memory, loss and time. The photographic archive is presented as a type of last testament to the momentary nature of these ruins. Although each car is now visually preserved, the inevitability of technological obsolescence is symbolic. Ultimately, the images testify and act metaphorically for untold histories, the chemistry of change, and the impermanence of life.